Apprenticeship vs Internship: Which should you hire? For an employer trying to decide between hiring an apprentice or an intern, it can be confusing. 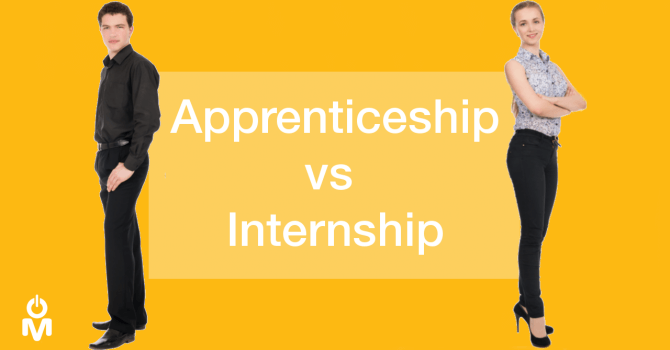 They both have their benefits and their downfalls but when it’s apprenticeship vs internship, which option comes out on top? Let us talk you through the similarities and differences between apprenticeships and internships. How much are they paid? At its core, the key difference between an internship and an apprenticeship is wages. There’s a lot of controversy surrounding whether or not interns should be paid, whereas the national minimum wage for an apprentice is currently set at £2.73 an hour (but will go up to £3.30 from October 1st). Whilst there are laws concerning how much interns should be paid, a lot of interns are still unpaid. It’s important to ensure that if you hire an intern you check their employment rights. There have been many cases of employers getting themselves into hot water by hiring unpaid interns when they should have been paid, so you don’t want to make the same mistake for your business. Who will be more motivated to work? Whilst both apprentices and interns will be eager for the placement, often those applying for internships are students or graduates with little work experience who are just looking to build up their CV. So they may be more likely to apply for internships in a variety of fields purely for the experience, rather than actually wanting a job in that sector. This could lead to them being unmotivated by their internship. An employer recently indicated to us that 70% of applications for apprenticeship positions are coming from desperate, but ineligible, graduates who are just applying for everything. On the other hand, an apprentice will be more likely to have an idea of what sector they want to be in, which means that they’ll only apply for those jobs. This leads to higher motivation once employed because their apprenticeship will be directly linked to their career progression. A factor to consider when hiring either an apprentice or an intern is whether or not they are just there to fill a skills gap. If so, will you be able to provide them with the support they need whilst learning a new skill or trade? For example, you may hire someone to undertake digital marketing activities in your business, but not know how digital marketing works for yourself. It’s important to consider the quality of education that you’ll be able to provide a potential intern or apprentice with. This is where apprentices may have an advantage over interns, because they will be able to get additional support from their assessors. Whereas with an intern, it’s your sole responsibility to provide them with the support they require. In addition, having a tutor for your apprentice means that both your apprentice and your business will receive the most up to date guidance for best practice, as well as consultancy and support. That on it’s own is a significant cost saving. Those are just a few of the similarities and differences between an intern and an apprentice, but it’s important to make a decision based upon your own business and requirements. In our experience, we’ve found that apprentices are better suited for most businesses. If hiring an apprentice for your business seems like the best option for you, or you’d like to find out more information, then contact us today.